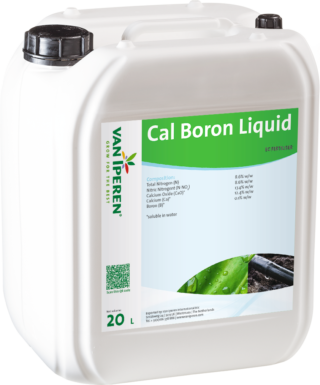 Van Iperen Cal Boron Liquid is a pure and highly concentrated liquid Calcium and Boron fertilizer, formulated with liquid Calcium Nitrate. Our product is a transparent, stable solution and is recommended as of early spring until fruit setting, especially as of bud development prior to flowering. The high level of Calcium and Boron in our formula improves the strength of cell walls and cell division. The presence of Nitrogen has a positive effect on the uptake of Calcium in the plant. In case of foliar feeding as part of a mix with crop protection products, a compatibility test has to be done prior to preparing the spray-mix. 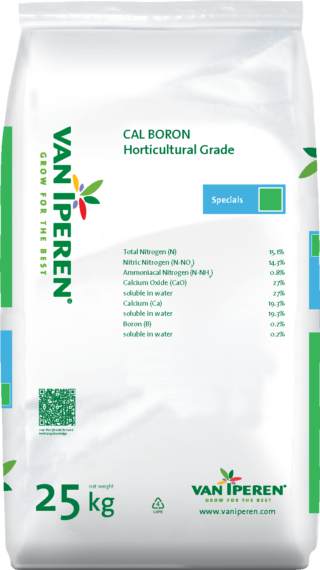 Compatible with other fertilizers, with the exception of Sulphate or Phosphate fertilizers. Therefore a separate tank is needed or fertilizers should be applied at different times.